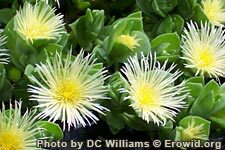 Sceletium tortuosum is a succulent groundcover which produces showy white flowers with threadlike petals. Its fermented roots and leaves were chewed by the Hotentot tribe of S. Africa as a vision-inducing entheogen and inebriant. The plant contains mesembrine, though the pharmacology of kanna is not fully understood.